The previous homeowner installed built-in armoire cabinets and bookcases that I plan to remove. In order to facilitate the opening of the armoire cabinet door, they cut into the window sill and apron with a Sawzall. 1.) Try to replace the entire sill and apron. I'm not a carpenter, so this might prove to be impossible. 2.) Use some kind of filler compound / putty to rebuild the sill and apron to an acceptable level. 3.) Use compound / putty to rebuild the sill and replace the apron, which should be easier to replace than the sill itself. I would appreciate any advice or help you can give me in making this determination. Thank you! Drop the wood putty idea. That is just not workable for this situation. I believe you are on the right track with the apron...just replace it...but fix the sill as below before installing the new apron. For the sill I would recommend getting some paint stripper and taking off the existing paint on the sill. Once you have exposed the cut off area of the sill you can evaluate whether the cut is nice and straight and smooth. If not it may be necessary to make it so. The next step involves getting a piece of nice wood of the same thickness (pine would be good to work with). Cut out a triangle of the wood that will be glued to the cut off area. When you size and cut this piece leave it a bit larger in the direction facing into the room so that once attached you can plane and and sand the front edge to match the existing sill. How nice of a match you can get between the edges of the mating parts. Ability to clamp the triangle piece into place. Consider the possibility to screw or nail the triangle piece into place although this could be very difficult due to the approximate 45 degree angles involved. Consider the possibility to use dowels or biscuits to hold strengthen the joint when it is glued. Using these does require special tools and may be tricky to use when dealing with the still installed existing sill board. Once you have success in attaching the new piece you can plane and sand the the corner till the surface and edge merge points are smooth and even. After that you can prime and repaint the sill area. (Remember the stripping recommendation at the beginning...you will appreciate that when it comes to repainting and how you can get it looking nice. 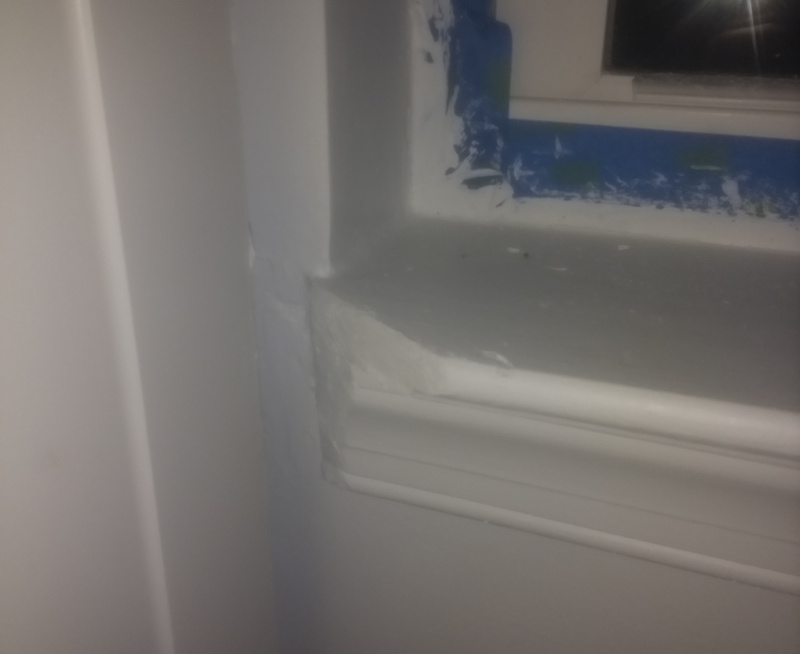 It would be a pain to try to make the corner look good if you just tried to patch paint the corner). Not the answer you're looking for? Browse other questions tagged wood windows trim or ask your own question. Replacing rotted brickmold and sill - what’s the sill piece called? What's the best way to recreate exterior wood trim? What's the best way/tool to cut a strip of drywall out of my window boxes? What's the best way to fix skirting board without nails / screws? What's the best way to cover my egress window (not soft plastic) where the window is above the window well? Best method for sealing underneath basement window sill? For my window, what's the best way to seal and insulate?